Military corporal punishment is corporal punishment in the military (the armed forces of a nation), which includes the army, navy and air force. Military corporal punishment was very common and harshly used in the past; as of today it is no longer practiced in many countries. Because of its severity, the delinquent is usually restrained. An exception in which the delinquent was not restrained was running the gauntlet (as depicted in the 1965 film The Round-Up). The subjects of military corporal punishments are (or have been) usually soldiers and sailors. Flogging in the US Navy was carried out with a whip, applied to the sailor's bared upper back. It became controversial in the 1840s. A paper, "A Plea in Favor of Maintaining Flogging in the Navy", written by an anonymous naval officer at that time, survives and can be read online. The practice was officially abolished in 1862. Flogging with the cat-o'-nine-tails was prevalent in the British Army until the mid-19th century. It was officially abolished in 1881. Caning across the seat of the trousers remained lawful for boy soldiers until 1956. Unofficial caning, though technically illegal, has been known to take place in difficult battle conditions when the normal system of punishment is not practicable, as in Burma in 1943. Unofficial corporal punishment still takes place in modern times, in which servicemen accept punishment from their own comrades without the involvement of officers. In the Royal Navy, flogging with the cat-o'-nine-tails for adult sailors was suspended in 1881 and never resumed, though not formally abolished by the British Parliament until 1949. Boy sailors up to the age of 18 (more recently called junior seamen) were birched until 1906 and since then extensively caned, especially at naval training establishments but sometimes also on board seagoing ships, until corporal punishment was abolished altogether in 1969. Canings were severe: up to 12 very hard strokes were applied to the youth's buttocks, which were covered only by thin white duck trousers, with no underwear permitted. Numerous accounts of these ceremonies survive. "Kissing the gunner's daughter" was a common term used to describe the flogging of boy sailors on board ships in the Royal Navy. The boy was bent over the barrel of a cannon and tied to it, and was beaten on the bare buttocks with a cat-o'-nine-tails, cane or birch. In Singapore, formal corporal punishment (in the form of caning, for males only) is an official component in the disciplinary system of the armed forces. A subordinate military court can order a soldier to be punished by up to a maximum of 24 strokes of the cane (with a maximum of 12 strokes per offense) at any one court martial. The officer in charge of the disciplinary barracks (where military offenders are detained) can also order caning without a court martial. The offender is bound to a caning trestle (similar to the one used for judicial caning) in a bent-over position and is beaten on the buttocks, which are covered by a protective layer of cloth to prevent serious injury and bleeding. Soldiers receive light caning in the Royal Thai Army for minor offences. These canings are very much less severe and formal than the Singapore military ones. They are typically carried out in front of comrades, with the offender standing up straight with folded arms to receive a stroke or two on the seat, just as in the typical Thai school caning. Engraving showing corporal punishment among Trenck's Pandurs (c. 1760). Military flogging, illustration by Yuri Evgenevich Kashtanov. 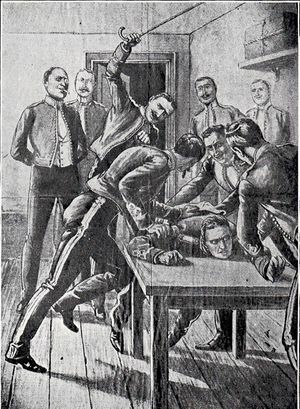 Military punishments, illustration by Yuri Evgenevich Kashtanov. ↑ Anon., "A Plea in Favor of Maintaining Flogging in the Navy", 1840s. US Navy Department Library. ↑ Brief History of Punishment by Flogging in the US Navy, US Navy Department Library. Includes contemporary drawings of floggings on board ships. ↑ Corporal punishment in the British Army at World Corporal Punishment Research. Includes drawings. ↑ "Punishment code in the Chindits", The Times (London), 16 October 1946. ↑ Recent video clip showing unofficial bare-bottom slippering of a British army lad (known as "reefing"). ↑ Corporal punishment in the Royal Navy at World Corporal Punishment Research. Includes drawings. ↑ Singapore: Caning in the military forces at World Corporal Punishment Research. Includes a photograph of a military caning in progress. ↑ Video clip of a group caning of Thai soldiers. Military caning in Singapore at sgWiki. This page was last edited on 10 February 2019, at 20:55.